An unmanned cargo ship loaded with spare parts, science equipment and crew supplies -- including ice cream treats -- rocketed into orbit Sunday and set off after the International Space Station, kicking off a new era of commercial flights intended to restore a U.S. supply chain that was crippled by the shuttle's retirement. The Dragon capsule and its Falcon 9 rocket, both built by Space Exploration Technologies, took off with a rush of fiery exhaust at 8:35:07 p.m. EDT (GMT-4), quickly climbing away from launch complex 40 at the Cape Canaveral Air Force Station. Making its first operational flight under a $1.6 billion NASA contract, the 157-foot-tall Falcon 9 arced away on a northeasterly trajectory paralleling the East Coast of the United States, putting on a spectacular evening sky show for area residents and tourists. Liftoff was timed to roughly coincide with the moment Earth's rotation carried the pad into the plane of the space station's orbit, the only way for the spacecraft to catch up with its 5-mile-per-second target. Generating more than 855,000 pounds of thrust, the Falcon 9 went supersonic one minute and 10 seconds after launch as its nine first stage Merlin engines boosted the spacecraft out of the dense lower atmosphere. About one minute and 28 seconds into flight, engine No. 1 suffered a dramatic malfunction of some sort, triggering a bright flash in the exhaust plume and what appeared to be debris falling away in the rocket's wake. The first stage fell away about three-and-a-half minutes after launch, about a half minute later than expected, and the single second stage engine then continued the push to space. Live television views from a camera mounted at the base of the second stage showed the engine nozzle glowing cherry red against the black of space as the rocket climbed toward orbit. The second stage appeared to operate normally and the Dragon capsule was released about 10 minutes and 24 seconds after liftoff. A few moments later, cameras showed the capsule's two solar arrays unfolding and locking in place. SpaceX founder Elon Musk said in an email to Spaceflight Now that the rocket "detected an anomaly on one of the nine (first stage) engines and shut it down." "As designed, the flight computer then recomputed a new ascent profile in realtime to reach the target orbit, which is why the burn times were a bit longer," he said. "Like Saturn 5, which experienced engine loss on two flights, the Falcon 9 is designed to handle an engine flameout and still complete its mission. I believe F9 is the only rocket flying today that, like a modern airliner, is capable of completing a flight successfully even after losing an engine. 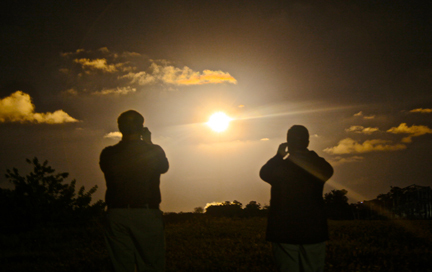 There was no effect on Dragon or the space station resupply mission." Launched into an initially elliptical orbit with a high point of 204 miles and a low point of around 126 miles, the spacecraft will carry out a complex computer-orchestrated series of rendezvous rocket firings to catch up with the space station early Wednesday. Unlike Russian, European and Japanese cargo craft that routinely visit the station, the SpaceX Dragon capsule was designed to make round trips to and from the lab complex, giving it the ability to bring major components and experiment samples back to Earth for the first time since shuttles stopped flying last year. "Not only is it going to give us a consistent supply chain up, but very critical, particularly to biological research, is the return mass, to be able to have frozen samples returned home," said space station Program Manager Mike Suffredini. "This really is the keystone to what is going to allow space station to do what it was built to do. It's critical to the success of the station." If all goes well, station commander Sunita Williams and Japanese astronaut Akihiko Hoshide will use the lab's robot arm to grapple the Dragon capsule around 7:22 a.m. Wednesday, maneuvering it to a berthing at the Earth-facing port of the forward Harmony module. Over the next three weeks or so, the station crew will unload a half ton of equipment and supplies, including experiment hardware, a freezer, spare parts, clothing and food. Taking advantage of the freezer, ice cream was included, a rare treat for space crews. As the capsule is unloaded, the astronauts plan to stow nearly a ton of no-longer needed gear, failed components and experiment samples that, until now, have had no way to get back to Earth. Again using the robot arm, Williams and Hoshide plan to unberth the capsule Oct. 28 for re-entry and splashdown in the Pacific Ocean off the southern coast of California where recovery crews will be standing by. The Russian Soyuz spacecraft that ferry crews to and from the space station can only carry a few hundred pounds of small items back to Earth. All other station vehicles -- unmanned Russian Progress supply ships and European and Japanese cargo craft -- burn up during re-entry. "The SpaceX Dragon is a really important vehicle for us because it supports the laboratory use of ISS, both in bringing cargo up to the space station and in bringing research samples home," said Julie Robinson, the space station program scientist at NASA Headquarters. "It has a great return capability, it essentially replaces that capacity that we lost when the shuttle retired so that now we'll be able to bring home a wide variety of biological samples, physical sciences samples and we'll be able to bring home research equipment that we need to refurbish and then relaunch again." Scott Smith, a nutritionist at the Johnson Space Center in Houston, will be eagerly awaiting crew urine samples for on-going medical research on how the body adapts to weightlessness. "We have not brought any samples back since the last shuttle flight," he told reporters Saturday. "When NASA knew the shuttle was going to retire, we actually flew extra freezers to the space station to hold those samples so the crews could continue to collect samples on orbit knowing we would bring them back when we had the chance. "The novelty at this point of SpaceX is this is the first real return vehicle for these type of samples. Obviously, we can get the crew home on the Soyuz, but the cargo capability of the Soyuz is extremely limited. So this is our first set of samples that will come back." Anticipating the shuttle's retirement, NASA announced a new program, Commercial Orbital Transportation Services, or COTS, in 2006 that called for development of new unmanned cargo craft that would be procured by the government on a commercial basis. NASA eventually awarded two major contracts. Orbital Sciences of MacLean, VA, holds a contract valued at $1.9 billion for eight cargo flights to the station. Another $288 million was budgeted for development and at least one test flight. An initial demonstration mission is expected early next year. SpaceX, short for Space Exploration Technologies, holds a $1.6 billion contract with NASA to provide 12 cargo flights to the station for delivery of more than 44,000 pounds of equipment and supplies. The company originally planned three test flights under a separate contract valued at up to $396 million. 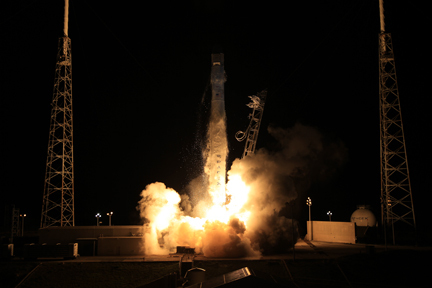 After an initial success in December 2010, NASA allowed SpaceX to combine the objectives of the second and third test flights into a single mission, which was successfully carried out last May. That cleared the way for the company's first operational cargo resupply services mission -- CRS-1 -- under the $1.6 billion contract. "We are required under this contract to fly 20 metric tons up to the International Space Station," said SpaceX President Gwynne Shotwell. "With the way it looks, over the 12 flights we'll be taking up and back about 60 metric tons." Even with a failure, she said, "given the capacity we have on the Falcon 9 and the Dragon flights, I don't believe there's any chance we won't hit our 20-metric ton target." The Dragon capsule is 14.4 feet tall and 12 feet wide, with trunk section that extends another 9.2 feet below the capsule's heat shield that houses two solar arrays and an unpressurized cargo bay. The spacecraft can carry up to 7,297 pounds of cargo split between the pressurized and unpressurized sections. 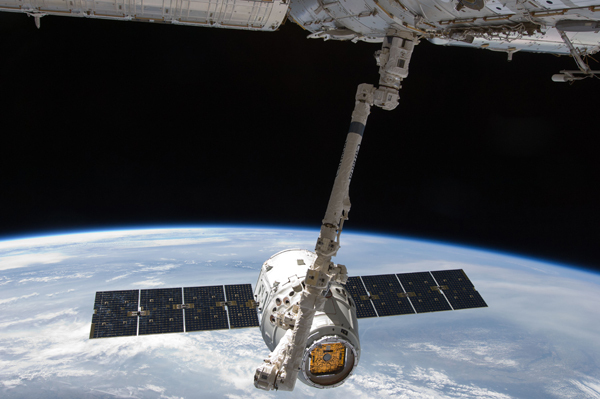 Under a $440 million contract with NASA, SpaceX engineers are working on upgrades to convert the Dragon capsule into a manned spacecraft that can ferry crews to and from the station. SpaceX managers believe they will be ready for initial manned test flights in the 2015 timeframe, assuming continued NASA funding. Two other companies, Boeing and Sierra Nevada, are developing their own spacecraft designs under similar contracts. 260 pounds of crew food, clothing, low-sodium food kits and other crew supplies. 390 pounds of science gear, including a low-temperature Glacier freezer for experiment samples, fluids and combustion facility hardware, a commercial generic bioprocessing apparatus, cables for the Alpha Magnetic Spectrometer and research gear for the Japanese and European space agencies. 866 pounds of science gear and experiment samples, including 400 samples of crew urine. Smith said "it may be urine to you, but it's gold to us. There's a lot of science that comes out of this."